Behind the grille of the T-Series wall model is a range of high performance extract/intake ventilating units designed to fit through most wall thicknesses using telescopic liners supplied. For walls of exceptional thickness additional liners can be used. T-Series also features a unique speed control pack which enables high, medium or low speed to be preset to suit room size or required duty. Conduit entry is provided for concealed wiring. T-Series controllers may be used with this model to obtain a choice of speeds, reversible airflow direction and automatic sensor operation. When used with a T-Series TSC controller, the speed control pack is removed from the T-Series ventilating unit and fitted into the 3-pin socket in the back of the controller. The Vent-Axia Ecotronic controller gives even greater running economy with its minimum speed setting and 'E' mode. When using the Ecotronic controller the speed control pack remains in the fan. ventilation without the security risk of an open window. Motor purpose-designed. Suitable for running at any angle. Quiet running, enclosed. Suitable for operation in ambient temperatures from -40°C to +50°C. Fitted with Standard Thermal Overload Protection (S.T.O.P.). Designed to fit into most double brick walls using the telescopic liners, supplied. Additional liners are available to accommodate exceptionally thick brick walls. 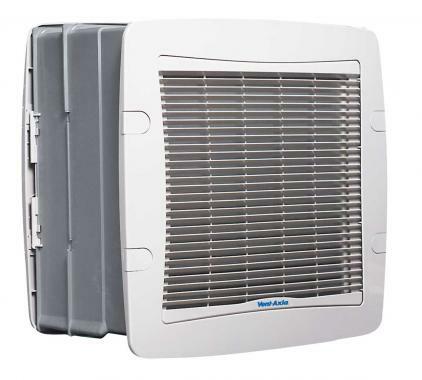 Behind the grille of the T-Series wall model is a high performance extract/intake ventilating unit designed to fit through most wall thicknesses using the telescopic liner supplied. For walls of exceptional thickness additional liners can be used. Conduit entry is provided for concealed wiring.